Margaret has just sent off a long letter to you with all the news, and “Christie” will gather up the fragments that remain;—so I have no “facts to communicate”,—I will—chiefly to congratulate you on getting off your arrears and passing the examinations; you have certainly done wonderfully, dear; I am as proud of you as possible, and immensely relieved too,—especially as both Margaret and Mary E. report you as looking very well; so I may hope the extra strain has not hurt you. Tuesday morning,—I was interrupted yesterday; a tea in the afternoon and a dinner at the McElroy's at night have prevented my resuming until now. Your delightful letter came at breakfast time, and we all enjoyed every word of it. Your account of the Intercollegiate meeting and your description of the girls was most interesting. It must have been entertaining in the last degree to compare the girls from the various colleges. I don't wonder though that you are tired now that it is over. We did not hear from Nellie last week either and I have been wanting to telegraph for several days, but your Father was sure that we would certainly have heard if anything was wrong. But when no letter came this morning I could stand it no longer so I have telegraphed;—will hold this letter open until the answer comes. Yet surely I should have been told if she is unwell!Madge comes home just after commencement Thanksgiving and is going to stop in Raleigh to see Nell. MayEd Brown's wife will probably go with her as she expects to send Marjorie there next year and wants to see the school. Won't that be nice for Nell?Madge is in a social whirl—constant dinners &c. &c. given her by the women, and box parties at the opera by the men. 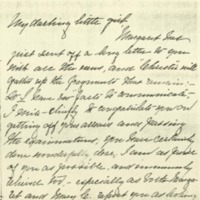 She sent a long amusing newspaper account account of the beautiful reception given her by May,—full descriptions of all the women's dresses &c. “Miss Axson, whose beauty is of the patrician type, with brunette colouring wore a pale yellow silk with.—” &c &c.!It certainly was disappointing about the game for everyone here fully expected to win,—yet, they say Yale distinctly outplayed us. But the game was certainly more entertaining than usual because more open and not so brutal,—no one was really hurt. It was unprecedentedly short, because there were so few delays to enable the players to regain consciousness! So every one is pleased with the success of the new rules. Wilson, Ellen Axson, “Ellen Axson Wilson to Jessie Woodrow Wilson Sayre,” 1906 November 19, WWP17356, Jessie Wilson Sayre Correspondence, Woodrow Wilson Presidential Library & Museum, Staunton, Virginia.